Available on amazon in soft cover, hard cover, and e-book. Currently there are 30 reviews – take a look. E-book $4.99, and only $3.99 with CBD. Also available with Westbow Press. Positively Powerless reveals the deceptions of the positivity movement that engulfed our culture. Break free from its chains, and be reestablished in a God-centered life. Not sure what the “positivity movement” is? Find out in my book! It drastically altered American culture in the 20th century. Evidence of this philosophy is everywhere once you are aware of it. It can hide in plain view because it became such a natural way of thinking. Think positive? The self-help genre? Optimistic motivational philosophy? The self-esteem methodology? These pervasive things did not always exist, and are historically rooted in occult, mystical, and Eastern religious principles of the 19th century. This approach to life not only engulfed America but influenced Christianity. Yet Christianity and the positive thinking mentality stand in stark conflict to each other. “Positively Powerless by L.L. Martin is her first book but I hope it will not be her last. What I thought would be an overview of the history of the positive thinking movement turned out to be an examination of our need for the gospel to squelch the self-focus this movement inspires. The author presents the hope of the gospel in relation to self-deception, pride and the humanization of God.” – Full review here. 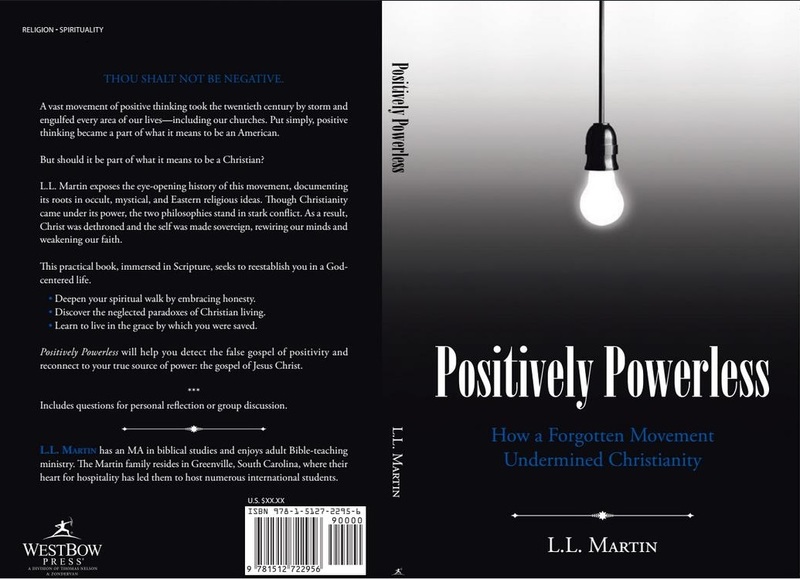 “It raises some good questions about how we think about God, ourselves, and the Christian life….Positively Powerless is a short, unintimidating read that will open your eyes to the pervasiveness and powerlessness of the positive thinking movement.” – Full review here. “I think Martin speaks compellingly of the ‘virus’ of positive thought that has infected the American church…Her purpose is not to name names or criticize ministries (from which she refrains) but to restore biblical discernment…This book is a great example of constructive theological discernment in an age of either unthinking sentiment or outrage.” -Full review here. If you’d like a free copy of my book, use the contact form found under the “speaking” tab. I can offer a code for a free e-book download. No e-book codes left. HOWEVER, I can still offer a free tangible copy if you live in the USA.